Hostel M is conveniently located just one MRT stop north from the Taipei Main Station, only 3 mins by walking to Zhongshan MRT station, where is filled with great restaurants, department stores, and bustling shops and stores of all kinds. 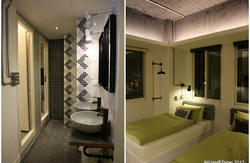 Hostel M provides clean free linen, WIFI and private locker for each traveler. In the common area, you will find free travel information/map, cable TV, and comfortable sofa to mingle with other travelers. Hostel M is your hostel of choice. It's conveniently located, has a wonderfully helpful staff and want you to have a pleasant stay while in Taipei. Feel the charm of our hostel and hospitality while experiencing the genuine local way of life and culture at the local sites. With only a small amount of guests, we are able to put more focus into the quality of your stay and help you enjoy the city of Taipei, even when traveling alone. If you arrive super early or late, welcome to inform us first. ** From Taiwan Taoyuan International Airport to Hostel M will take around 1.5hr, please offer the arrival time for reaching Hostel M since we are not 24 hr reception. ** English & Japanese speaking staff will help you out all the time. ** We are located above an elegant beauty salon and next to 2 schools, please walk softly up and move gentle during your stay. Backpackers hostel in Yilan. Enjoy the beach, surfing, hiking, hot spring and party in northern Taiwan!! We have special offer for staying Rising sun after staying Hostel M.
Take MRT (subway) to Zhongshan MRT station and follow the previous instruction. Take airbus or high speed rail direct to Taipei main station then take MRT(subway) to Zhongshan MRT station and follow the previous instruction.